Paper Status: Accepted to ApJ. Before you roll your eyes – I don’t mean any old dust, I mean space dust. In particular, we’re interested today in the giant debris disks that reside around nearby stars – huge clouds of gas, dust, pebbles and even asteroids, a little like our own asteroid & kuiper belts. As you may know, when stars first form they are surrounded by protoplanetary disks. As they age, the dust normally disappears – it is blown out of the system by stellar winds, or falls onto the star surface via the Poynting-Robertson effect. But occasionally, a debris disk is maintained well into the ‘teenage’ period of the star’s life (by which I mean a few tens of megayears). These debris disks are interesting. The dust is generally assumed to be continuously regenerated by planetesimals, suggesting that the building blocks of planet formation are present in the system – a tantalising hint that there may be planets hidden within these disks. We can learn about these planets by looking at the dust – be it observing the complex warps, gaps and other morphologies in an attempt to dynamically find the mass of a planet, or in comparing the composition of the dust and the planet to understand planet formation. But how much do we actually know about these debris disks? Since the disk around nearby star β-Pictoris was first imaged back in 1984, you might assume that astrophysicists would have it pretty much figured out by now . . . sadly, you’d be wrong. In fact, models of various nearby debris disks have consistently struggled to fit both the thermal emission (the dust acting as black body emitters of far-infrared and radio wavelength radiation) and the scattered light emission (the dust acting a bit like a mirror and reflecting visible and near-infrared radiation from the star) at the same time. And it’s a pretty tricky game to come up with the right model, since it involves understanding dust that covers not-very-many pixels of your telescope CCD, with a model that can be incredibly complex. A perfect model would consider the dust distribution, dust scale height, composition, grain size, grain shape, grain porosity, dust/gas ratio, etc. – there’s a lot going on! It is, of course, difficult to understand all of this diverse physics with the limited data we have. 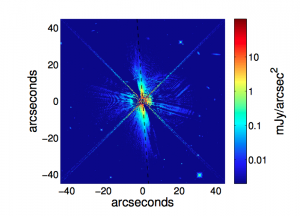 Today’s paper focuses on understanding the dust composition of the β-Pictoris debris disk. β-Pictoris is an interesting star, as it hosts a simply huge debris disk, one of the first ones to be discovered. It’s also really nearby – just over 60 light years away – and the system even boasts one of the first ever directly imaged planets, namely β-Pictoris b. So there’s a fair bit of β-Pictoris data floating around. In fact, the authors today use five separate images spanning the range from optical to radio wavelengths, and including two images taken by the Hubble Space Telescope and one by ALMA. Some of this data is shown in figure 1. In an attempt to reduce the complexity of the problem, the authors fit the spatial distribution of the debris disk first, and then the composition entirely separately. This works, because at lower wavelengths the resolution is fairly good. After lots of careful modelling, the authors come up with the first self-consistent model that fits both the thermal and the scattered light emissions, which is a promising sign for their model. Turning their focus to composition, they conclude that the dust is probably a mixture of silicates and organic materials, with not much in the way of water ice – this modelling is shown in figure 2. This seems to fit well with previous studies showing that the β-Pictoris system hosts crystalline material in its debris disk. The composition of the debris disk appears agree with work by other people on a similar debris disk hosting star, namely HR4796A. This is another hint that the authors are probably on the right track. The authors point out that their method can be used to characterise of other nearby debris disk systems. Over the next few years, with the advent of SPHERE and ALMA, more discoveries of and insight into debris disks are to be expected. The more we understand about debris disks and the space dust they contain, the more we can learn about the planetary systems and how they form, and this paper certainly helps towards achieving that goal! I'm a final year PhD student at the University of Exeter, in the south of England, where I'm aiming to detect and characterise extra-solar planets and debris disks via direct imaging. So far this has meant lots of detecting background stars that happen to be well aligned with bright, nearby stars and no detecting of actual planets - but hopefully my luck will change soon!